Life without Jesus is a disaster. Life with Him is peace and happiness. Of James Memorial Higher Secondary School’s enrollment, 243 live in dormitories. About 100 of these live in the aging girls’ dormitory, which was designed for far fewer residents. It contains only five bathrooms, making it inadequate for those who live there. Part of this quarter’s Thirteenth Sabbath Offering will help build a new dormitory that will house more girls in a far more healthful and livable environment. 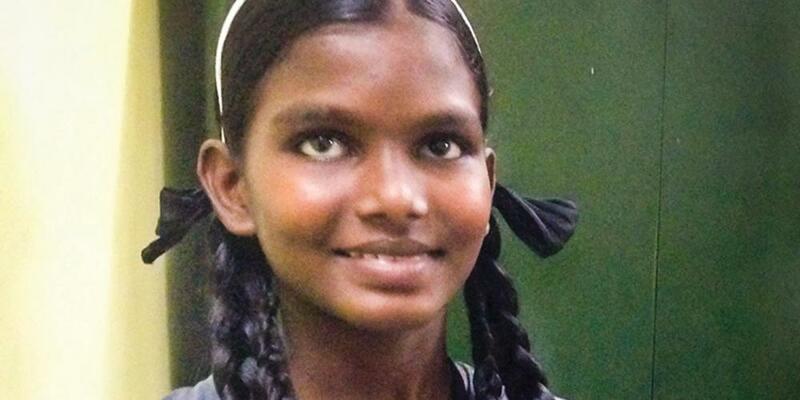 Vaishali [pronounced: VY-shah-lee] is a 15-year-old student at a Seventh-day Adventist boarding school in southern India. Ask a teen girl to present this first-person report. Some of my earliest memories are of my mother crying as my father brutally beat her. Sadly, this happened often. My father was a vegetable seller, but he drank heavily and lived in a drunken stupor for much of my childhood. When I was 8 years old, neighbors introduced us to a Seventh-day Adventist pastor. He prayed for my family and told us stories about Jesus. He said Jesus could save us and take away our burdens. He said Jesus could comfort the broken-hearted. That sounded wonderful to my mother and me. We gave our lives to Jesus and accepted His forgiveness for our sins. We joined the Seventh-day Adventist family. My father, however, refused to join us. He kept drinking and beating my mother. Seeing my desire to obey Jesus, my father took his anger out on me as well. My father’s anger was affecting me badly. I could not focus on my schoolwork, so I stopped going to school for three months as I tried to stay away from my father. Finally, my mother took me to a town some miles distant to get away from my father. Mother wanted a new beginning for both of us. We moved into the home of friends. But my father found out where we were living and actually moved in with us! He stayed for only three days before something bad happened. My father stole from the owners of the house. In the middle of the night, he left the house with steel buckets and other equipment that he sold to buy alcohol. My mother decided to take me far away where my father wouldn’t find me. She sent me to live with my grandparents for a while. Then she learned about James Memorial Higher Secondary School in southern India. Deciding that the school was the best place for me, she took me to this school to live and study. She works as a janitor to pay for my school fees. This school has really helped my education. It also has increased my knowledge of God and given me peace of mind. I am now 15, and I am glad to be living here. But I haven’t forgotten my father. Every day I prayed that he would give up alcohol and give his heart to Jesus. Then last year the most amazing thing happened! My father confessed his sins and repented of his bad ways. He stopped drinking and stealing and was baptized. He is now a Seventh-day Adventist. I am so happy! I still pray every day that my father will never drink again. God is answering my prayers. My father is a new man! I don’t know what will happen in the future. But I am sure of this: Life without Jesus is a disaster. Life with Him is peace and happiness. I love this school, where young people like me can study and learn together. Some are Seventh-day Adventists when they arrive, others are Christians but not Adventists, and some don’t even know who Jesus is. But we live and learn together, and many of my new friends find Jesus here. That makes me so happy! Part of this quarter’s Thirteenth Sabbath Offering will help build a new girls’ dormitory at James Memorial Higher Secondary School. The current girls’ dormitory is old, and the bathrooms can’t serve the 100 girls who live with me there. The new dormitory will make it possible for lots more students to live and study at this school. Please remember this school in your prayers and with your Sabbath School mission offerings. Thank you.